Lloyd Knecht, Local businessman and owner of ANC Heating and Air Conditioning has announced he is running for Town of Union Supervisor. Knecht will be facing Republican incumbent John Bernardo. In 2008, Knecht was brought before the Endicott village court when he refused to allow firefighters in to his business on Jennings Street in the Village of Endicott. The court reject his motion to dismiss the case on Fourth Amendment grounds. He was convincted, fined $50,000, and tentatively sentenced to 270 years in jail. Knecht won an appeal of his conviction in Endicott Court. He says the court victory has made him a hero among people who are frustrated with high taxes, regulation and unhelpful government officials. "By winning that case, I can't tell you how many people came out of the woodwork, the normal, quiet majority that are out there, and we've all kept our mouths shut and pay our taxes, I understand that. But, I stood up to the government." Llloyd Knecht has a drive for signatures happening right now. Knecht needs around 750 signatures to be on the ballot. The latest figures show he needs about 300 more signatures in the next few days. If you are a registered Republican, and live in the Town of Union(Endicott, Endwell, Johnson City). There are currently 14,750 Registered Republicans in Union, so this should not be too difficult. 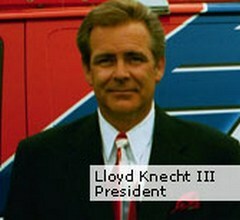 If you would like to see Lloyd Knecht on the ballot you can sign the petition at the former Arby's/Fish Fry at 2802 East Main Street in Endwell, NY. The Petition Central location is open daily from 9AM until 9PM. Paying people to collect signatures who don't know a thing about your positions gives us an idea of your style of leadership. The only people I am aware of collecting signatures for local candidates are people who already understand those candidates positions. While some candidates may pay people to help collect signatures, most do so as volunteers, and again they know the candidates position and are doing so because they agree with those people and have a desire to see them represent their interests in an elected position. Lloyd's an idiot! He has no chance. What a doofus!